From the 2nd to 11th November 2017 bars all over the planet will celebrate the world’s most iconic cocktail in classic form and with new, creative twists – a treat for rum aficionados wherever you are. 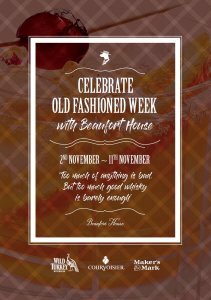 It is the worldwide contemporary celebration of this most classic of vintage cocktails, Old Fashioned Week is 10 days of Old Fashioned cocktail discovery including tasting events and cocktail masterclasses. The first written records of an Old Fashioned (the combination of spirit, sugar and bitters) date right back as far as 1802. In 1862, Jerry Thomas baptizes it the “Whiskey Cocktail”. Then in 1895, in the book ‘Modern American Drinks’ by George J. Kappeler, we see a Brandy Old Fashioned listed, based on the famous trio of ingredients. In fact, Kappeler only refers to an existing trend of drinking cocktails in certain style, as the imbibers of the day called for an “old fashioned” cocktail. The serve is now considered a classic and is very much back ‘on trend’, being served in all the best cocktail bars around the world, including Beaufort House Chelsea of course. We invite you to join us at The House where our bartenders will set aside their shakers and reach for their mixing spoons to serve up their twist on the classic Old Fashioned!